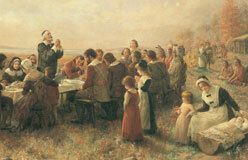 The Pilgrims of Plimoth Plantation led simple lives. Their attention was always on survival. But there’s another living museum, located some 600 miles and more than 100 years away from Plimoth. It gives visitors a view of a later and more comfortable Colonial America. This is Colonial Williamsburg. It was once the capital of Virginia. It was also the largest colony in America. In Colonial Williamsburg, the well-to-do ladies in fashionable gowns and gentlemen in powdered wigs took tea in the late afternoon. They also attended elegant balls at night. Meanwhile, slaves did the work that made this easy life possible. Colonial Williamsburg was built in the early 1700s after a fire destroyed the first capital of Virginia, Jamestown. 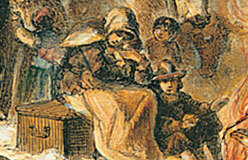 By the mid-1700s, Williamsburg was a busy seat of colonial government. 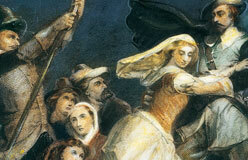 But when war broke out between Britain and her colonies, Virginia’s capital was again moved. This time it went to Richmond. 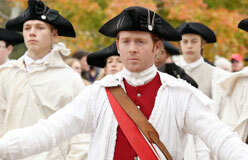 For the next 147 years, Williamsburg was just another sleepy small town. But in the early years of the twentieth century, Reverend William Goodwin had a dream of restoring Williamsburg to its colonial glory. In 1926 he got money from millionaire John D. Rockefeller Jr. In the following years, 720 modern buildings were knocked down. Eighty-eight original colonial buildings were restored. More than 400 houses and stores were rebuilt. By 1934, the restored town was ready for visitors. 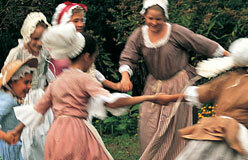 If you go there now, you can get a look at life in Colonial Williamsburg.